"AAT". Size: 4B70. Padlock Stamp #: 0816-E. Color: Green. Spaceship flying inside large circle. Made for: General Electric Aircraft Accessory Turbine Division, W. Lynn MA. Mfg by: Best. "ABLOY". Brass case. Steel shackle. Mfg by: Abloy Security Ltd. Oy. US Patent #D353531. "ABRAHAM & STRAUS". Size: 1B62-4M1. Padlock Stamp #: 1492-E. Color: Green. Made for: Abraham & Straus department stores, Brooklyn NY. Mfg by: Best. "AC SPARK PLUG" - Large Letters - Top of "A" Pointed. Size: 2B79. Padlock Stamp #: 0457-F. Color: Green. Flat version. "AC": .275" tall. Top of "A" is pointed. Made for: AC Spark Plug Co., Flint Michigan. Mfg by: Best. "AC SPARK PLUG" - Small Letters - Top of "A" Flat. Size: 2B72. Padlock Stamp #: 0457-E. Color: Green. Elliptical version. "AC": .225" tall. Top of "A" is flat. Made for: AC Spark Plug Co., Flint Michigan. Mfg by: Best. "AC SPARK PLUG" - Small Letters - Top of "A" Pointed. Size: 21B72. Padlock Stamp #: 0457-R. Color: Green. Roll version. "AC": .225" tall. Top of "A" is pointed. Made for: AC Spark Plug Co., Flint Michigan. Mfg by: Best. "a.c.f.". Size: 2B52. Padlock Stamp #: 0266-E. Color: Green. Made for: American Car & Foundry Co., Buffalo NY. Mfg by: Best. "A. C. P.". Size: 11B72. Padlock Stamp #: 2156-R. Color: Black. Made for: Not determined. Mfg by: Best. "A D L". Size: 4B61. Padlock Stamp #: 0158-E. Color: Green. Made for: American Diamond Line, New York City, New York. Mfg by: Best. "ADVANCED". Size: 4B72. Padlock Stamp #: 1796-E. Color: Black. Made for: Stilian Electric, Inc., Georgetown, Massachusetts. Mfg by: Best. "AEROCAV". Size: 11B72. Padlock Stamp #: 2041-R. Color: Red. Double-Incised italic letters. Made for: Aerocamiones de Venezuela, CA. Mfg by: Best. "PROPERTY OF AEROPRODUCTS". Size: 1B69. Padlock Stamp #: 0872-F. Color: Green. Horizontal stamp. Made for: Division of General Motors, Vandalia, Ohio. Mfg by: Best. "A.G.L. CO.". Size: 2B72. Padlock Stamp #: 0379-E. Color: Green. Made for: Atlanta Gas Light Company, Atlanta, Georgia. Mfg by: Best. "AIR CONDITIONING AIRTEMP INC. PRODUCT OF CHRYSLER". Size: 4B60. Padlock Stamp #: 0068-E. Color: Green. Made for: Chrysler Motors, Dayton, Ohio. Mfg by: Best. "ALABAMA POWER". Size: 4B722-M3. Padlock Stamp #: 1743-E. Color: Black. Made for: Alabama Power Co., Birmingham, Alabama. Mfg by: Best. "ALASKA POWER ADMIN.". Size: 2B72. Padlock Stamp #: 1458-E. Color: Blue. Old style, "ALASKA" = 3/4" wide, elliptical version. Made for: Alaska Power Administration, Juneau, Alaska. Mfg by: Best. "ALASKA POWER ADMIN.". Size: 41B72. Padlock Stamp #: 1458-R. Color: Blue. New style, "ALASKA" = 9/16" wide, roll version. Made for: Alaska Power Administration, Juneau, Alaska. Mfg by: Best. "ALCAN". Size: 4B62. Padlock Stamp #: 0899-E. Color: Green. Made for: Aluminum Company of Canada, Maligne, Quebec, Canada. Mfg by: Best. "ALCOA LAF. WORKS". Size: 11B72. Padlock Stamp #: 1937-R. Color: Green. Made for: Aluminum Company of America Lafayette Works, Lafayette, Indiana. Mfg by: Best. "ALEXANDERS". Size: 2B72-M1. Padlock Stamp #: 1405-E. Color: Green. The reverse of the case is the same as the obverse. Made for: Alexanders Department Stores, Inc., New York City, New York. Mfg by: Best Lock Co.
"ALL AMERICAN PIPELINE COMPANY". Size: 61B72. Padlock Stamp #: 1991-E. Color: Green. Made for: All American Pipeline Co., Houston, Texas. Mfg by: Best. "ALLIED PAPER". Size: 11B70. 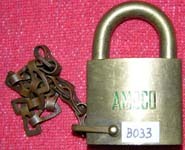 Padlock Stamp #: 1530-R. Color: Green. Made for: Allied Paper Inc., Jackson, Alabama. Mfg by: Best. "Allison". Size: 4B62. Padlock Stamp #: 0629-E. Color: Green. Made for: Allison Division General Motors Corporation, Indianapolis, Indiana. Mfg by: Best. "PROPERTY OF ALUMINUM CO. OF AMERICA". Size: 4B62. Padlock Stamp #: 0481-E. Color: Silver. Old style with flat oval "O" letters, elliptical version. Made for: Aluminum Co. of America. Mfg by: Best. "PROPERTY OF ALUMINUM CO. OF AMERICA". Size: 21B72-M. Padlock Stamp #: 0481-R. Color: Red. New style with elliptical "O" letters, roll version. Made for: Aluminum Co. of America. Mfg by: Best. "AM". Size: 4B62. Padlock Stamp #: 0935-E. Color: Red. Descending script letters, older logo. Made for: American Motors Corp., Kenosha, Wisconsin. Mfg by: Best. "AMERICAN ®". Size: 21B72. Padlock Stamp #: 2013-R. Color: Blue. Made for: American Crane and Equipment Corp., Douglasville, PA. Mfg by: Best. "AMERICAN GILSONITE COMPANY". Size: 4B62. Padlock Stamp #: 0743-E. Color: Red. Made for: American Gilsonite Co., San Francisco CA. Mfg by: Best. American Motors. Size: 2B72. Padlock Stamp #: 1510-E. Color: Blue. American Motors "A" logo, newer logo. "AMERICAN VISCOSE CORP.". Size: 1B62. Padlock Stamp #: 0333-E. Color: Green. Made for: American Viscose Corp., Roanoke, Virginia. Mfg by: Best. "AMES RESEARCH CENTER NASA". Size: 21B72. Padlock Stamp #: 1257-E. Color: Blue. Globe logo, elliptical version. Made for: Ames Research Center NASA, Moffett Field, California. Mfg by: Best. "AMOCO". Size: 5B71-M1. Padlock Stamp #: 0016-E. Color: Green. Block letters. Made for: American Oil Co., New York City, New York. Mfg by: Best. "AMOCO". Size: 2B612. Padlock Stamp #: 0808-E. Color: Green. Letters in oval. Made for: American Oil Co., Chicago, Illinois. Mfg by: Best. "AMOCO". Size: 21B72. Padlock Stamp #: 2053-R. Color: Black. Letters in large oval with torch. Made for: American Oil Co., Chicago, Illinois. Mfg by: Best.